The proposal, known as rules for Title IX — the civil rights law that prohibits gender discrimination in a person’s education — is widely expected to limit the scope of inquiries by colleges and universities and make it easier for students accused of misconduct to push back. Drafted by the Department of Education and under review by President Donald Trump’s budget office, the proposal is likely to spark heated debate. It follows the bruising confirmation fight for Supreme Court Justice Brett Kavanaugh, who was accused of sexual assault at a house party when he was in high school three decades ago. Two other women made similar accusations. Kavanaugh vehemently denied all of them. Advocacy groups involved in the ongoing discussions said among the provisions they expect to see in the final draft is one that wouldn’t require schools to investigate incidents that occur off campus, even if it involves students. Another provision would put schools on the hook to investigate allegations only if they’re made to certain designated authorities, such as the school’s Title IX coordinator. And the new rules would likely allow for more thorough cross-examinations, possibly requiring that the person making the allegation sit in the same room as the accused. Cynthia P. Garrett, co-president of a group called “Families Advocating for Campus Equality,” said she’s been pushing for these changes because they give students accused of misconduct better opportunities to defend themselves. Garrett, who also works with a similar advocacy group called SAVE, said she met with budget officials last week on the subject, a follow up to a meeting last year with DeVos. In 2017, DeVos convened several “listening sessions” with various stakeholders, including college Title IX officers and victims’ rights groups, as well as FACE and SAVE. Victims’ rights advocates argue that DeVos is downplaying the problem of sexual violence on college campuses. They argue the new approach would unfairly tilt investigations in favor of the perpetrator and dramatically reduce the number of women willing to come forward. “It limits the responsibilities of schools to respond to sexual assault … and it doesn’t take into consideration trauma” of the victim, said Shiwali Patel, senior counsel at the National Women’s Law Center, who up until this summer was working at the Education Department’s civil rights office on this issue. One major sticking point in the debate is disagreement on how widespread the problem of sexual assault really is. According to the Bureau of Justice Statistics, the most recent assessment on sexual assault on colleges is from 2016. That survey across nine diverse colleges and universities found that 25 percent of women reported that they had experienced unwanted and nonconsensual sexual contact since entering college. But the study notes that it didn’t collect details on the incident, such as the type of sexual contact. So how common are false allegations? The same office reported it doesn’t have that information and could only point to an FBI estimate from 22 years ago. That report estimated false accusations account for only 8 percent of cases. 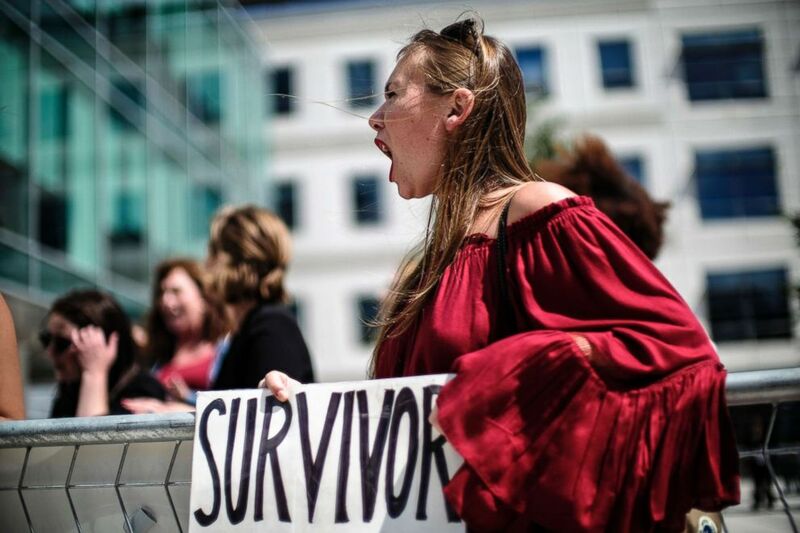 But a 2016 government report warned that statistics on sexual assault can be tricky because studies depend on who’s surveyed, what questions are asked and whether women feel emboldened to answer truthfully. 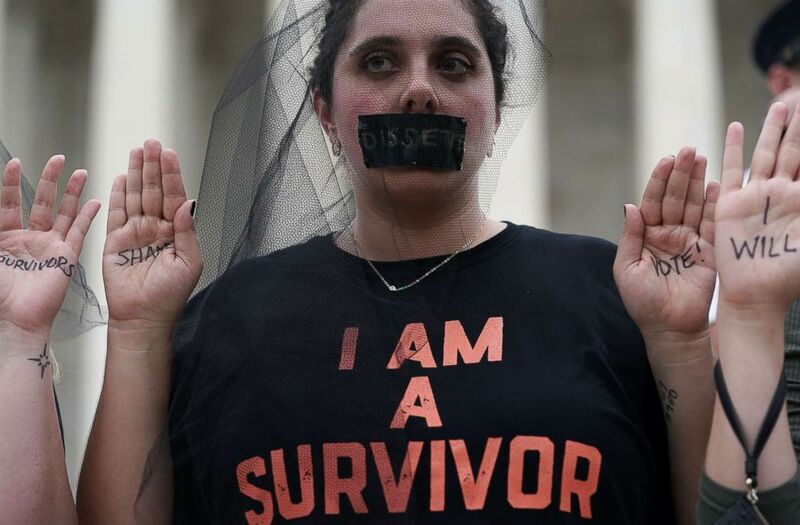 Activists occupy the front steps of the U.S. Supreme Court to protest the confirmation of Judge Brett Kavanaugh to the Supreme Court, Oct. 6, 2018 in Washington, D.C.
Last year, DeVos announced plans to replace Obama-era guidance and blamed a “failed system” for the “hundreds upon hundreds of cases” filed with the Education Department’s Office for Civil Rights. “Instead of working with schools on behalf of students, the prior administration weaponized the Office for Civil Rights to work against schools and against students,” she said. Helping to lead the effort under DeVos has been Candice Jackson, who wrote a 2005 book detailing assault allegations against former President Bill Clinton. She later swung behind Trump’s candidacy despite reports that he faced his own allegations of sexual assault. Women’s rights advocates including Patel counter that this kind of rhetoric grossly distorts the realities of sexual assault on college campuses. But one point she’d like to see addressed is how the Education Department wants schools to respond if students come to them with off-campus allegations of assault — if the final rules exclude off-campus sites, as expected.